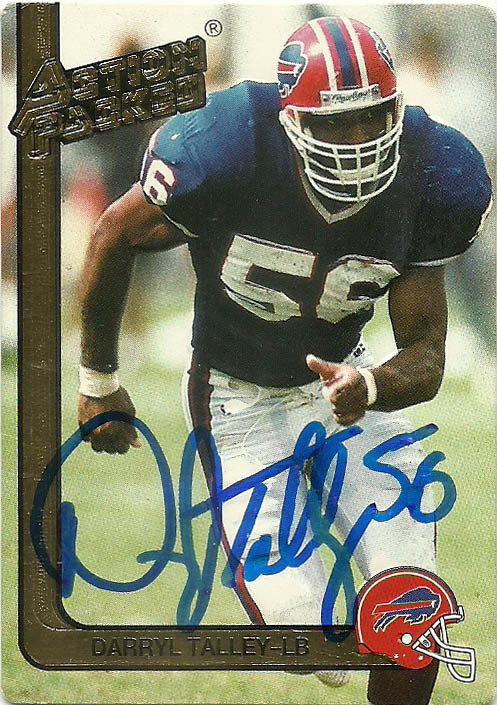 A second round pick of the Buffalo Bills in 1983, Darryl Talley never missed a game in 12 seasons for the Bills. The unusually injury immune linebacker was also a model of consistent play over his long career- that spanned in the end, 14 seasons and 4 Super Bowl appearances. 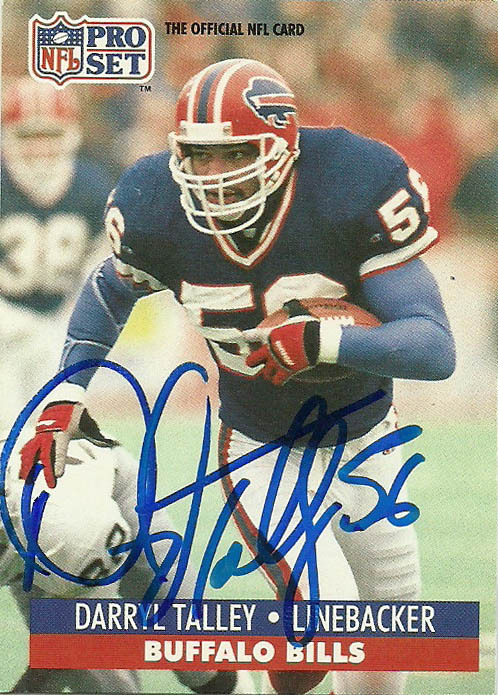 Talley is the Bills’ all-time leading tackler with 1,137 takedowns, to go along with 38.5 sacks, 14 fumble recoveries, 12 interceptions and 2 touchdowns. After the 1994 season, Talley hit the open market and signed with the Falcons, playing 1995 with them and 1996 with the Vikings before retiring. 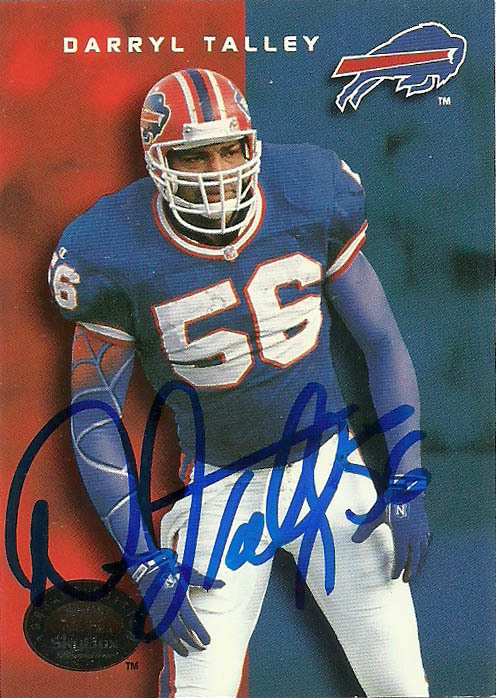 He was inducted into the Bills Wall of Fame in 2003, and named to the Bills 50th Anniversary team in 2009. Darryl has battled severe depression and financial hardship since his retirement, however he’s worked hard to conquer his demons, partially in part due to his wife and children. As of 2018 he acts as a football ambassador for the NFL Legends community of players. The goal is to reach out and help as many former players and let them know of the different programs that are available to them from the league. Here’s hoping things continue on the up and up for Spider-Man. Darryl Talley had some fantastic cards over his years in the league. I was pleased to add these 3 interesting designs and/or dynamic photos to the Encyclopedia. His Action Packed 1991 card embodies everything I want to see in an exciting solo shot of a linebacker, with Talley in full pursuit about to pop a ball carrier. The card itself on the front is minimally designed, and this appeals to me, and Darryl inked this card in the right spot to accent it perfectly. – High marks indeed. Skybox had a smart debut with their base set in 1992. Their subsequent releases, not-so-much. It didn’t help that they along with their counterparts flooded the market with so much content it was impossible to stay loyal to any card company and follow a release schedule. Mind you this was the high days of adventure before the internet! The ‘Colors’ 1993-1994 Skybox set was a really slick look but by the time this set came out, I had already had my bank account plundered regularly by the discovery of girls. Both this card and the ProSet 1991 showcase Darryl’s nice arm sleeves, that intentionally were in a webbed pattern to harken to his nickname- Spider-Man. ProSet set the standard from 89 to 92 really. (Nobody talks about ProSet 93.) That was also their problem. I felt the cards were the minimum I’d expect from a company to show me, even though what ProSet showcased with the minimal design was really outstanding for its era before Photoshop. Great photo of Darryl. It is too bad that ProSet ate itself out of the market. I wonder what their brand would look like today if it still existed. Overall though Darryl signed 3 of 4 cards, and has a great signature. I think I sent him a donation but honestly it was so long ago I can not recall.